V103.3 and Justin from Blue October are doing it live in ENC for Hurricane Florence Relief! 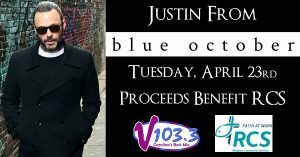 Join us at City Stage in New Bern on Tuesday, April 23rd for an intimate acoustic set with lead singer, songwriter & guitarist Justin Furstenfeld from Blue October. Their latest hit, “I Hope You’re Happy” is on V103.3 now! 100% of the proceeds will benefit Religious Community Services of New Bern. Admission is a minimum $5 donation to RCS per person at the door. Doors open at 6, and Justin will perform a mini acoustic set beginning at approximately 8pm.